Here's a way to give even the youngest children a bird's-eye view of how plants emerge from tiny seeds. They'll be able to see the baby plants develop every step of the way, through a plastic bag. The same process will be taking place hidden in the dirt in a pot at the same time, which will help the children understand what's going on in the world all around them every spring! Kids love this because they can see a process that's usually hidden, in the dirt. They also can't get over how plants can get their start with little more than air and water! But you're going to sprout smaller seeds, and wind up with some tasty herbs. First, wet a paper towel. Squeeze out the water so that it's moist but not wet. Fold it into a square or rectangle to fit inside the zip-lock bag. Sprinkle half the herb seeds on the towel. It's OK to push them around on the towel with a finger so that they're fairly spread apart. Slide the towel into the bag. Seal, except for about inch of one corner. Lay the zip-lock bag flat in a warm spot that is out of direct sunlight. Meanwhile, fill the paper cup or clay pot full of moist potting soil. Make sure to poke small drainage holes in the bottom of the paper cup, if you're using one. Plant the other half of the seeds in the soil as deep as the seed packet recommends. Mist with water from the spray bottle. Keep the soil moist - never soaked. Check the pot and the bag every day, using the magnifying glass if you have one. They are racing to see which one is the best home to make the seeds germinate, or sprout, first! Every other day, poke a finger inside the bag. If the towel feels dry, open the bag and mist it with the spray bottle. Then reclose - except for one corner. Check the soil in the pot and re-mist as needed. As the seeds begin to sprout, the hard seed coat that protected the seed will split open. Inside, the seed has a bit of stored plant food, and a baby plant just waiting to grow. Kids will enjoy learning that the first green leaves, called "cotyledons" (cot tle LEE dins) have stored plant food curled up within the seed all along. That's where the seed got the power to germinate. Soon thereafter, the plant's first true leaves will emerge. It's time to transfer the sprouts from the baggie to the soil, or else their roots can't sustain their growth any more, and they'll die. 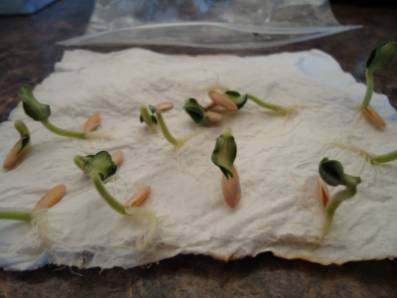 If the kids will let you, leave some of the seedlings on the paper towel, and check to see how long before they die. Transplant the other ones into additional paper cups or pots. Continue to watch the plants change as they grow. It's really fun to send one home with each child after a few weeks. When the plants look like the picture on the seed package, harvest a little at a time to add to salads and other foods. Rinse what you're going to eat with clean, cool water. Then add your homegrown herbs to your food. Nothing tastes better . . . and it all started in a lowly plastic bag!